The beautiful Fine Arts Building that housed the Adams Theater on Grand Circus Park in downtown Detroit as seen on a recent Saturday afternoon. Once the throbbing heart of a vibrant entertainment district, the crescent shaped Grand Circus Park was yet another victim brought about by the Hudson's abandonment of its downtown anchor store. 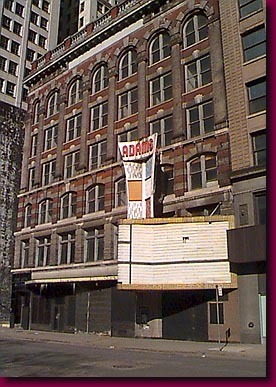 Queen of the north side of the park, the renowned Adams Theater in the once grand Fine Arts Building stumbled along for a few years and reincarnations until it silently disappeared in the 80's.